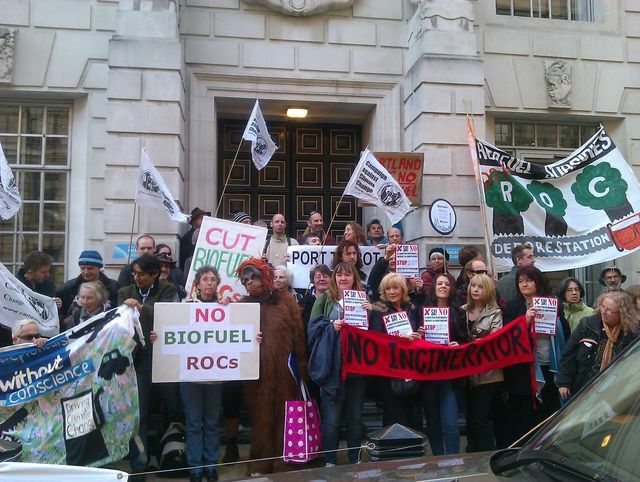 Protesters gathered outside the Department of Energy and Climate Change offices calling for the end of subsidies for bioenergy, in a demonstration organised by Biofuelwatch with the support of Campaign against Climate Change. As a public consultation on the financing of renewable electricity launched last week, campaigners warn that government proposals to prioritise bioenergy over wind and solar will speed up global warming and cause human suffering across the globe. Campaigners travelled from as far as the Isle of Wight, Scotland, Bristol, Port Talbot in Wales, and Manchester to unite in a common call. On 25 September 2010, the Campaign against Climate Change organised a national demonstration against agrofuels near a power station planned to burn palm oil in Portland, Dorset. This is only one of at least 15 biofuel power stations being proposed in the UK, encouraged by government subsidies (see below) have led to Experience in Germany and Italy, where large numbers of power plants are run on biofuels, have shown that those are almost always run on palm oil, the cheapest vegetable oil,and the one whose production is most damaging to the climate. Running power stations on other types of biofuels, particularly on a large scale, has not been shown to be economically viable so far. 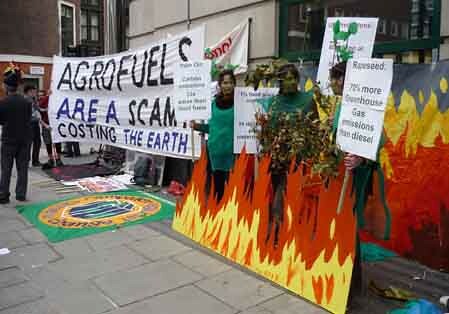 The Campaign against Climate Change, Biofuelwatch and Food not Fuel joined together to tell the Department for Energy and Climate Change that Agrofuels don't ROC(k). As well as speakers from UK groups, the demonstration was joined by representatives from Coordinadora Latinoamericana as part of a day of actions in solidarity with indigenous people. Energy companies now have to generate a minimum of 10% of their electricity output from sources classed as sustainable or buy Renewable Obligation Certificates (ROCs) from companies who have. This is a subsidy paid to renewable energy producers from other energy companies. Biofuels are included in this subsidy scheme, despite strong evidence of their negative climate impact. 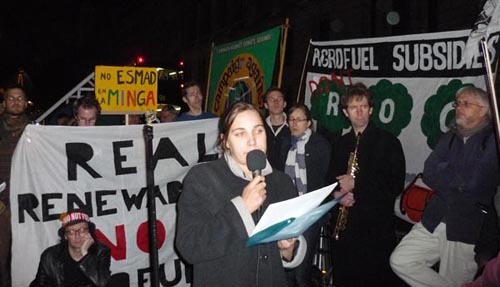 The Campaign against Climate Change joined forces with Biofuelwatch to protest against the Renewable Transport Fuel Obligation (RTFO) and the devastating impacts caused by a massive increase in biofuels. 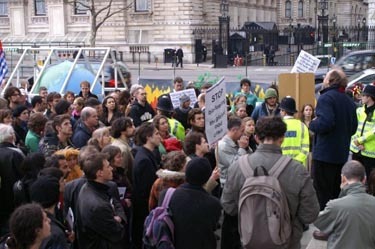 The protest, staged outside Downing Street at 6.00 pm, was the largest demonstration yet against biofuels and was widely reported on the day. The European Union biofuels directive sets targets for all EU countries for biofuel usage of 2% by the end of 2005 and 5.75% by the end of 2010. To fulfil this, in the UK, the RTFO requires transport fuel suppliers to ensure that a certain proportion road vehicle fuel is biofuel. The amount of biofuel that must be supplied increases annually until April 2013 when it will reach 5%.